In 1893, Gandhi is thrown off a South African train for being an Indian and traveling in a first class compartment. Gandhi realizes that the laws are biased against Indians and decides to start a non-violent protest campaign for the rights of all Indians in South Africa. After numerous arrests and the unwanted attention of the world, the government finally relents by recognizing rights for Indians, though not for the native blacks of South Africa. 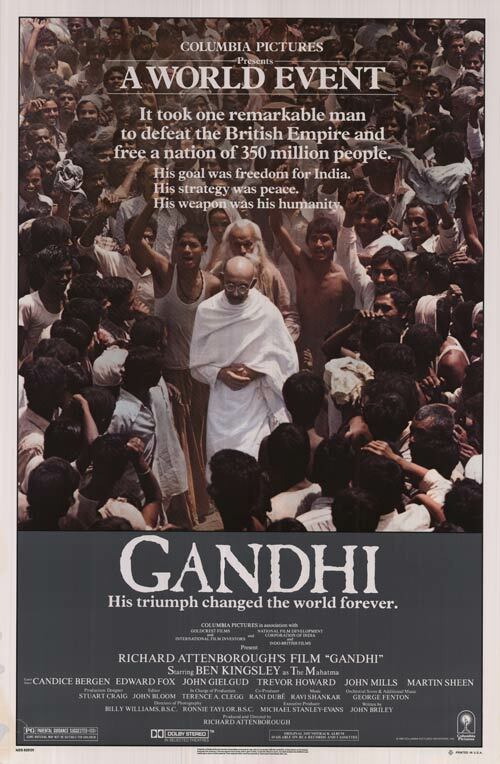 After this victory, Gandhi is invited back to India, where he is now considered something of a national hero. He is urged to take up the fight for India’s independence from the British Empire. Gandhi agrees, and mounts a non-violent non-cooperation campaign of unprecedented scale, coordinating millions of Indians nationwide. This entry was posted in Drama and tagged Ben Kingsley, biography, Drama, Gandhi, history, Richard Attenborough. Bookmark the permalink.